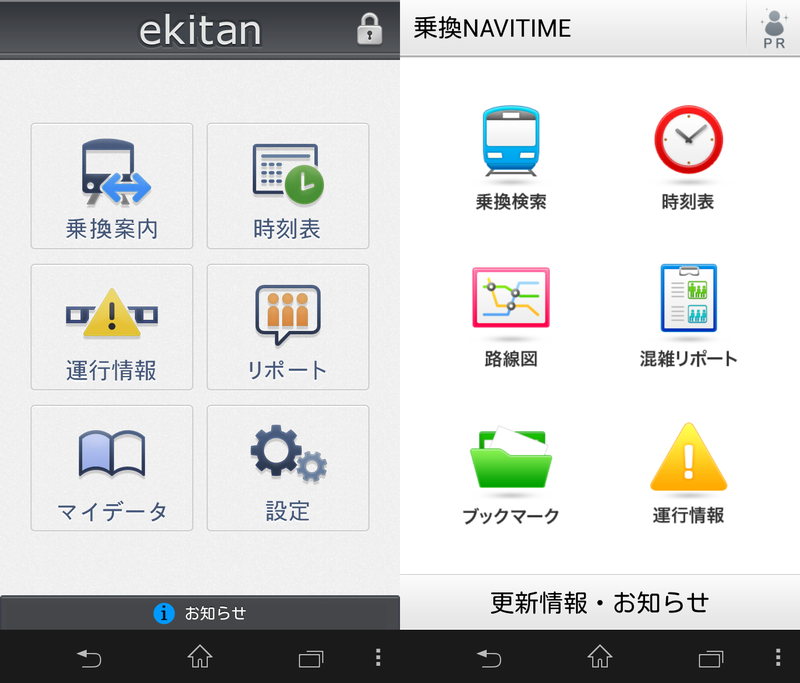 A couple of years ago, I tried the major free train transit apps and came to the conclusion that none were stellar (some links here). Following the discussion on the Jorudan and romaji post, I went back and tried a few again. Unfortunately, this is still the case, though there are improvements in usability, probably mainly due to the greater resources in modern phones. The developers are typically established companies that charge way too much for buggy apps. They have institutional memory of the i-mode, walled garden days when almost all information services were subscription and continue to employ that model today. For example, the premium jorudan plus app costs ¥630, but this only gives 90 days of usage. Continued use requires a subscription of ¥200 per month.You can save about 8 yen per month by paying for an entire year up front (¥2,300). 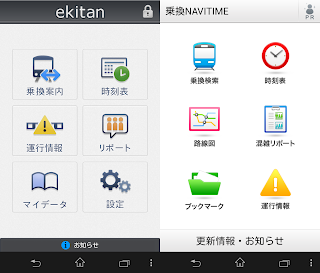 Neither Ekitan nor Navitime have a separate premium app, but to unlock all their features requires paying ¥210 per month. Premium services typically unlock features like bookmarks and saved searches, as well as offering additional ways to proceed after initial search results (without restarting the search). There are two osetnsible justifications for this. Old i-mode phones had limited resources, so saved routes, stations, and whatnot were stored server-side, not on the phone. The subscription allowed continued access. The other justification is that the transit data are not static but must be sporadically updated as schedules change to provide precise, accurate transfer directions. The train companies do not give away for free this information, and some make it difficult to even scrape. So the developers are paying for the schedule. And of course customers are accustomed to paying for this stuff. After using various apps, both on my phone and on the PC, I've recently landed on Google Maps. I find their interface to be the easiest, the continuous updates / improvements tickle my fancy, Google Maps seems to understand better than Jorudan or Navi Time that I can walk between stations and sometimes that makes more sense than taking the train an extra few stations just to transfer and finally by using Google Maps things show up in Google Now which I just like. Hey there, I had tweeted at you about this but I'd like to continue the discussion here. Since I use my phone bilingually I bought Swype after seeing that it supported Japanese, but was sorely disappointed by several things. I ended up ditching Swype after about 2 months of continuous use. 1. The first thing I noticed is that the whole Swyping metaphor translates very poorly to romaji-input Japanese for daily practical use. There are too many "close keyboard matches" when doing Japanese, and Swype is very unforgiving. In English it works well in predicting the word that you most likely wanted even if your swipe was a character or two off, but the same logic doesn't apply to Japanese romaji input - I suspect it is just statistically much more difficult to calculate accurately with the lack of variation in spellings. 2. Try typing Tanishige-san 谷繁さん or any other name or proper noun that isn't a 田中 or 鈴木. You have to manually use the press the arrows and break it down for so many things as Swype's Japanese vocab is very limited. Irregularly read location names that don't correspond with normal "on" or "kun" readings are out of the question. Google gets it on the first try, likely because of the huge amount of search and conversion data they have. ATOK is also very good. We are talking massive data and R&D costs that go into a quality Japanese input keyboard, and when I saw that Japanese is just one out of many supported languages with Swype, I lost optimism that they would be able to take it to the appropriate level to compete with the big dogs that spend all their energy on perfecting Japanese alone. Flick input, on the other hand, is much, much more accurate and very speedy; the keys are big and you can almost type without looking while walking. Google input has just about perfected it IMO, and most proprietary maker keyboards have it down pretty well too. I now use Kii which has a globe button that switches straight to Google JP flick input with no menus. However, you can't do the same thing in reverse unfortunately. To get back to Kii English input, you hold down the bottom left key of Google's flick input, which then brings up an option to select input method, from which you can choose Kii. It's not ideal, but it is better than having to swipe the notification bar down and hunt for it both ways. If you just need to put in simple, common Japanese words occasionally and barely ever use Japanese for daily grammatical composition, maybe Swype is acceptable. I remember when I had the Xperia X10, it had a keyboard that switched between flick Japanese and a decently autocorrected English keyboard. I haven't looked for more recent proprietary keyboards. It's a shame that accomodating bilinguals doesn't seem to be a big priority for most. why not use Yahoo! 乗換案内 ? My SC-05D (docomo's Galaxy Note) updated to 4.1.2 last night. * I was surprised to see that Swype is now one of the keyboard/IME choices, and it appears to be the full version. I haven't used it much yet, though. * It tried to download the 600MB update file into the 300MB of App Storage I had free, not the 7.5GB I had free on Storage Card, nor the 24GB I had free on the external_sd. After the error message, I removed a dozen apps and restarted the update without further problem. It's definitely more viable now than it was before. It was a heavy piece of software to startup just to check the train schedule on older, single core 1GHz phones with limited RAM. Mainly because it's yahoo. (but I'll give it a look). I used to use Google maps quite a lot for train routes, but recently it's been giving me really retarded routes that I doubt anybody would ever want to use. It's basically useless IMO since you can't specify "cheapest" as the optimization condition. I think it's standard to want to find the best balance between cheapest and easiest, but I find these optimal routes often don't come up with Google anymore. Recently Google map became an excellent choice, especially with Google Now that will automatically suggest you the last train schedule to go back home at night from your location. Don't even have to ask for the way to go home, he will suggest it every night before it is too late, and this is so convenient! Is there seriously still no good option on Android for flick-style Japanese input, coupled with sensible/predictive English QWERTY input? Swiftkey keyboard is in beta phase for both Japanese and Chinese. Now they're in separate testing, but one day they will be merged into one release.